Get up to speed on the storage technology inside memory cards, smartphones, USB sticks and the new solid-state drives. Flash memory is inside your smartphone, GPS, MP3 player, digital camera, PC and the USB drive on your key chain. Solid-state drives (SSD) using flash memory are replacing hard drives in netbooks and PCs and even some server installations. Needing no batteries or other power to retain data, flash is convenient and relatively foolproof. Flash memory is a solid-state chip that maintains stored data without any external power source. It is commonly used in portable electronics and removable storage devices, and to replace computer hard drives. As with other solid-state technologies, flash memory's history includes rapidly increasing capacity, ever-smaller physical sizes and continually falling prices. Flash memory is a type of electronically erasable programmable read-only memory (EEPROM), memory chips that retain information without requiring power. (This is different from flash RAM, which does need power to retain data.) Regular EEPROM erases content byte by byte; most flash memory erases data in whole blocks, making it suitable for use with applications where large amounts of data require frequent updates. Inside the flash chip, data is stored in cells protected by floating gates. Tunneling electrons change the gate's electronic charge in "a flash" (hence the name), clearing the cell of its contents so it can be rewritten. Flash memory devices use two different logical technologies -- NOR and NAND -- to map data. NOR flash provides high-speed random access, reading and writing data in specific memory locations; it can retrieve as little as a single byte. NOR is used to store cell phones' operating systems; it's also used in computers for the BIOS program that runs at start-up. NAND flash reads and writes sequentially at high speed, handling data in small blocks called pages. This flash is used in solid-state and USB flash drives, digital cameras, audio and video players, and TV set-top boxes. NAND flash reads faster than it writes, quickly transferring whole pages of data. Less expensive than NOR flash, NAND technology offers higher capacity for the same-size silicon. As a NAND chip wears out, erase/program operations slow down considerably, causing more retries and bad block remapping. Moving many small files could further degrade transfer rates. Catastrophic failure happens only with extended use (after thousands of writes and accesses); periodic backup and replacement forestall this problem. 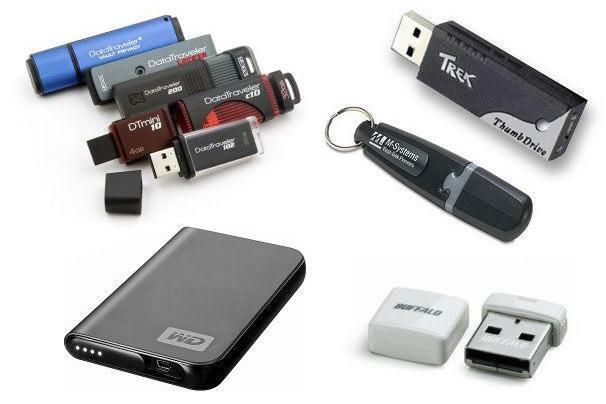 USB drives: Introduced in 2002, USB drives encapsulate flash with a memory controller in a small package offering high capacity, fast transfer rates, flexibility and convenience; some feature built-in hardware encryption and password protection. Compared with floppy or optical drives, USB flash drives store more data and provide easy file transfer between most devices with a USB interface. In December 2004, Computerworld described a 2GB flash drive selling for more than $400; nowadays, 2GB devices can commonly be found for under $10. This February, Kingston Technology Corp. announced U.S. availability of a 256GB flash drive -- the biggest yet -- for $1,100. Memory cards: These have evolved from the matchbook-size CompactFlash cards introduced in 1994 through 2001's postage-stamp-size Secure Digital cards to the latest miniSD and microSD cards, with higher capacities and faster transfer speeds at every step. Solid-state drives: The newest flash memory application, SSDs can replace a computer's hard drive. They have no moving parts, so mechanical failure is near zero. Solid-state drives are quieter and smaller than hard drives, and they provide faster response, access and boot-up times but consume much less power and run cooler. Traditional hard drives currently offer greater capacity and a lower price, but this will likely change. Early concerns that flash memory's finite number of erase/write cycles would be a problem are abating as warranties for flash-based SSDs approach those of hard drives.